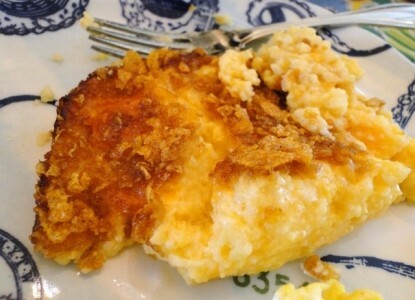 Cook grits in boiling salted water until done (about 12-15 minutes) Add butter, cheese stirring until melted. Lightly beat eggs and milk together, then add to grits. Pour into prepared pan, sprinkling with extra cheese. Bake in prepared oven for about 45-60 minutes. You can prepare all the way to baking the night before and just pop in the oven in the morning. I just put it in the cold oven and let it heat up with the oven. You may have to cook for a little longer if you do it this way.